Highly Recommended New Weird Fantasy. Good and evil fought a war, and evil won. Most of the gods are dead and now warlocks run the world by being partners in evil witchcraft law firms. One of the handful of remaining gods is Kos Everburning, a divinity whose eternal love for his people is the source for all the heat in his worshipper’s lives. Kos magically provides heat for Alt Coloumb’s factories, powering industry and trains, making his city one of only a handful of hub-cities left in the war-scarred world. Alt Coloumb is on the verge of chaos as the burning heart of it’s industry and religion is snuffed out. The international monetary system is also about to collapse because Kos is a middleman between the godly pantheons and warlock law firms. Tara Abernathy is a junior partner at Kelethres, Albrecht and Ao, a law firm which specializes in necromancy. Tara and her boss Elayne are sent in to perform a profane miracle and resurrect a dead god. The only problem is that Kos’s creditors want to carve chunks out of the dead divine corpse before they can do it, essentially liquidating the god’s divine assets before the god is brought back to life. I last read this book in 2014, and I have to say that the story has only improved with age. 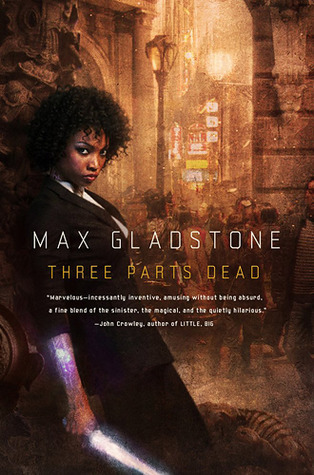 Max Gladstone tells a parable of vampires, magic and eldritch deities which has more in common with modern day international law, banking and dirty-dealing than anything out of the Tolkien or G. R. R. Martin. Plot: Reduced to it’s most basic level, this is a law-thriller. Tara, Elayne, Abelard and Kat are trying to puzzle out the mystery of how Kos died in order to figure out who they can legally blame and then get that person to foot the bill for the resurrection. Was it the corrupt Church of Kos, who runs the boilers and steam pipes of Alt Colomb? Was it the Guardian Gargoyles, a long-outcast branch of warrior statues which worship a long-dead god? Or perhaps is it the opposition warlock lawyer, a shady character who Tara and Elayne both have reason to hate? Pacing: A smidgen too fast. As a thriller, this works: the book is almost nonstop plot and action, the frame of the story constantly jumping from one scene to the next. As a fantasy story, where one expects more characterization and world building, this almost works. Unfortunately the author doesn’t let the characters and setting live and breathe as much as he could so the story feels rushed. Characters: Tara, Abe, and Elayne never really get a chance to breathe and grow as characters. Kat gets a bit of growth, but as one of four protagonists it’s not enough to carry the book in that department. Setting: is awesome. The Craft Sequence is a nightmareish steampunk Alternate Earth where mankind figured out magic and rebelled against the gods. In the protracted war which followed mankind’s craftspeople (aka warlock lawyers) became entrenched in world politics and the gods were forever knocked down a peg. And yet what could easily be a story of good-vs-evil, isn’t. The lines of the righteous and corrupt is blurred and made less clear, for the ‘heroes’ of this story are all underdogs who engage in shady dealing in order to save the day while the villains use their power (both divine and profane magic) for greedy ends. The best part of the setting is the author’s narrative voice. He brings a sense of humor to events, coloring this exceedingly grimdark setting so that the ridiculous and the mundane shines through the dire circumstances. The audiobook narrator really captures this aspect. As mentioned, the pacing was too fast. None of the main characters were particularly memorable or amazing. Tara is not on the same tier as Locke Lamora, Ista, Bilbo, Fitz or Discworld’s Death. Honestly, she’s not really on on the tier under them either. Don’t get me wrong, Tara, Elayne, Abe and the rest are all fun to read and have distinct personalities, but they are not jaw droppingly memorable. They don’t have hobbies. They don’t have obscure phobias. They are fun characters with entertaining dialog and worldviews, but they are a smidge two dimensional. The plot, while fun, involved a significant amount of handwavium. The setting’s magic is basically a magical version of the law: gods are essentially large multinational corporations, legal arguments in courts are magical combat between two wizards, and you have to read the fine print very carefully because you never know if the warlock lawyer who wrote the contract included a loophole about ‘ownership of your soul.’ This is a FUN theme to base a setting about. However Craft law is entirely the focus of this story… but since the law is never explained before hand, the plot got resolved without the reader being able to predict it because we didn’t know how the law works. In short, the author failed to adequately foreshadow one or two plotpoints until the moment they were needed. Net total, highly recommended. This book is really up my alley, so I can look past it’s flaws. For other people, they might be weirded out by how weird this story and setting are and might not like it as much. For me this is one of my top ten books of all time, but a ton of other Fantasy genre readers probably wouldn’t even be able to finish this book. I suggest you give it a shot.